With April being Financial Literacy Month, college counselors and advisors have been experiencing an influx of financial questions from parents and students. We’ve put together a list of eight resources to help you develop your skills and knowledge. There are also some great financial tools you may want to pass along (this month, and in the future) to your students and families as they work to pay for college! 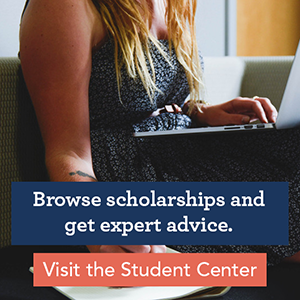 The U.S. Department of Education has a section devoted to Federal Student Aid Resources, including a Financial Literacy Resources Presentation half-way down the page. The presentation contains an introduction and three main sections: What is Financial Literacy?, The Knowledge Gap: What Students Don’t Know and Financial Literacy Tools and Resources. It covers topics parents and students often inquire about, such as comparison shopping, applying for aid, budgeting and managing debt. Within the presentation you will find additional links to other websites, like College Navigator. Here you can find industry publications and statistics, and the latest news and current events to stay informed. Another linked resource is Money Smart, a financial education program by the Federal Deposit Insurance Corporation. The program targets low- and moderate-income students and aims to increase their financial skills. Money Smart curriculum is free and available in instructor-led and self-paced formats. The Practical Skills Program is an online program sponsored by Visa. The website contains articles designed for both educators and individuals. Topics range from large scale economics to best practices to managing a budget. A variety of lesson plans are designed for students pre-kindergarten through college. Free DVDs, brochures, and other materials are available to order and research, infographics, and podcasts offer additional information. Parents and students who visit the website can benefit from personal finance basics and life event education, including saving for college. Games, applications, and videos offer multimedia learning opportunities. Money Management International, a business devoted to financial education, has its own Financial Literacy Month Toolkit. The toolkit, available in both English and Spanish, includes information products, such as e-books and news articles, but it also includes tools for communicating and advertising Financial Literacy Month to an audience. You will find email and social media templates, a digital badge, and a free downloadable poster. The Community tab is a great source for clients, consisting of social media outlets that can be accessed year-round. Feed the Pig is part of a national public service campaign sponsored by the American Institute of CPAs and The Advertising Council. Feed the Pig provides guidance on the saving process and helps young adults manage their money by setting financial goals. The website also covers topics relevant to college students, such as credit cards and student loans. The toolbox offers calculators, podcasts, and links to additional financial resources. Familiarizing yourself with available tools keeps you well-informed and provides insight into different options that are better suited for particular learning and organizational styles. The National Associate of Student Financial Aid Administrators is an excellent resource for professionals. Information on associations, policies, and programs is broken-down by region and state for easy access. Links to advocacy, research, and books for sale will keep you up to date on the entire field. The website has a “Students, Parents & Counselors” section that may be useful to you. It lists resources to expand your professional development and a speaker mentor directory for connecting with other professions. You will also find counseling tools and Spanish language resources for successful interactions with students. One unique feature is the information provided for counseling students in special circumstances, such as those from a foster home or those who are currently homeless. The National Endowment for Financial Education has multiple Financial Workshop Kits, including one specifically for college students. Basic topics include budgeting, finances after graduation, and pitfalls to avoid. More specialized topics include identity theft and working with Native American/ Pacific Islander students. All topics include FAQs, presentation materials, and additional resources. In addition to the Financial Workshop Kits for college students, there are Workshop Kits for Unique Audiences that may be useful for students and their parents. Here is where you fill find financial resources for individuals with disabilities, adult learners, and low-income individuals. Also available are financial resources for special situations, such as students and families struggling with addiction, living in transitional housing or recovering from domestic violence, or former inmates who are rebuilding their finances. The National Association for College Admission Counseling has a variety of learning opportunities, including the webinar “Financial Literacy: Concepts and Resources to Help Families Make the Best Financial Decisions”. Activities like watching the webinar and taking the quiz may be eligible for Continuing Education Units through the National Board for Certified Counselors. Use the website to stay up-to-date on events and conferences, such as the Counselors’ College Fair scheduled for October 2 in San Diego. This government office has a Financial Literacy Resource Directory. The directory provides a reputable list of organizations that deal with financial literacy education or policy. Resources are categorized by topics, including but not limited to: Basic Financial Literacy, Consumer Protection, Credit Management, Financial Literacy and Education Commission, Reaching Out on Financial Literacy, Tax Assistance, and Youth Programs. If the first seven resources have not satisfied your need for material, you are likely to find the source you are looking for in this listing.